This ramble began at the Ferry Building and traveled northwest along San Francisco Bay via the Embarcadero, to the Levi Strauss headquarters building. 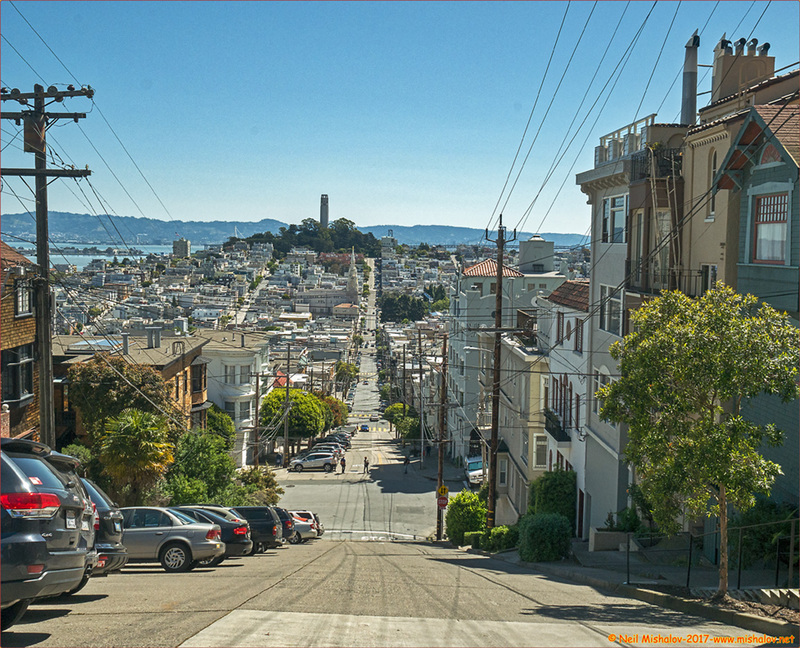 The route then ascended Telegraph Hill via the Filbert Steps and the Greenwich Street Stairs. After which, the ramble continued to the Presidio of San Francisco, the conclusion of this walk. 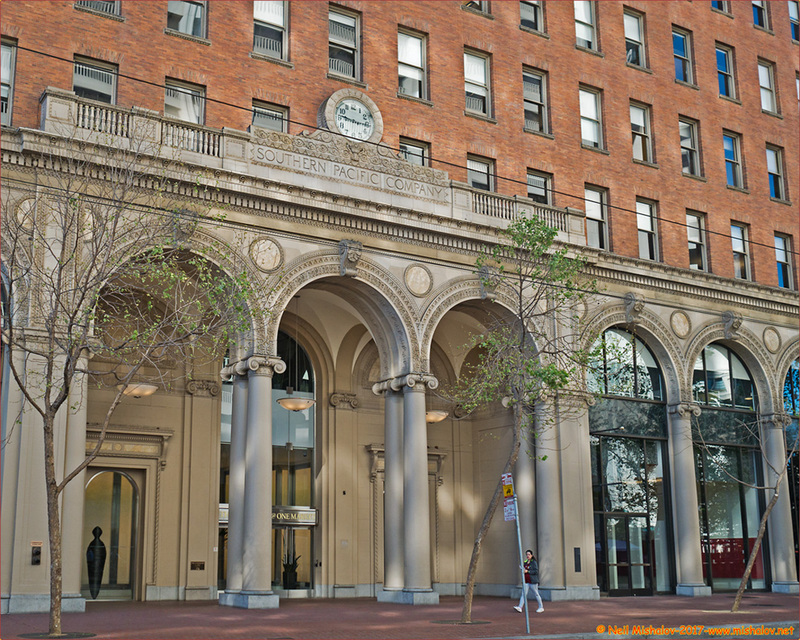 The Southern Pacific Building is located on Market Street near the Embarcadero. The construction of the building began in 1916 and was completed in 1917. 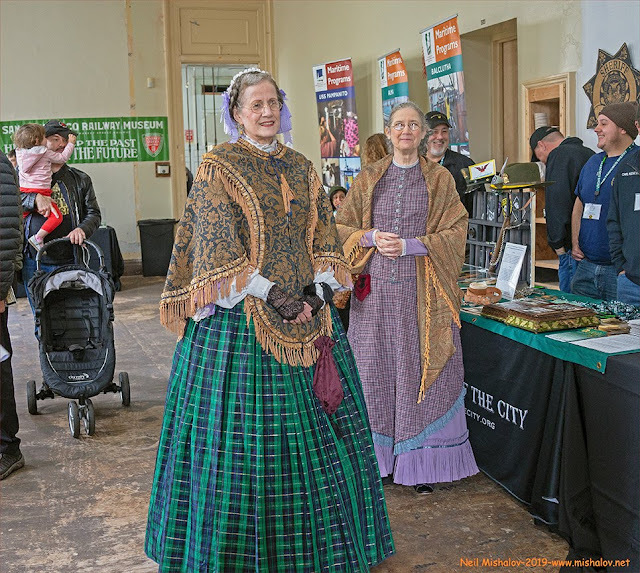 The property was the headquarters for the Southern Pacific Railroad; it was the tallest steel-framed structure west of the Mississippi River at the time of its construction. Click on the image to see the full-size photo. The distance traveled was approximately 5.2 miles (8.4 kilometers). The cumulative elevation gain was about 553 feet (168 meters). Mile markers are displayed on the GPS generated track. Click on the image to see the full-size map. 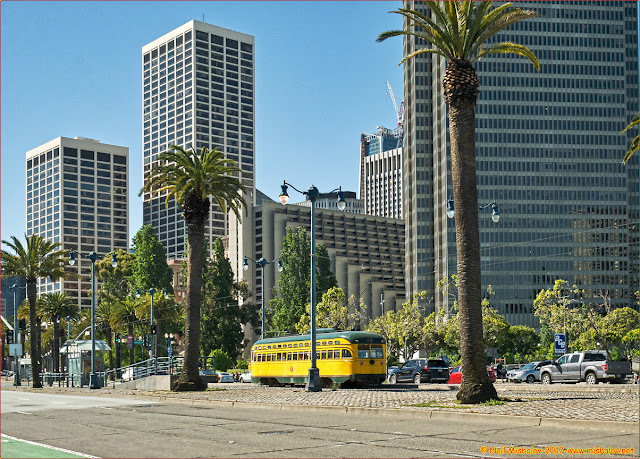 This photo was taken from the Embarcadero. Market Street Railway streetcar #1071 is traveling towards the Ferry Building. 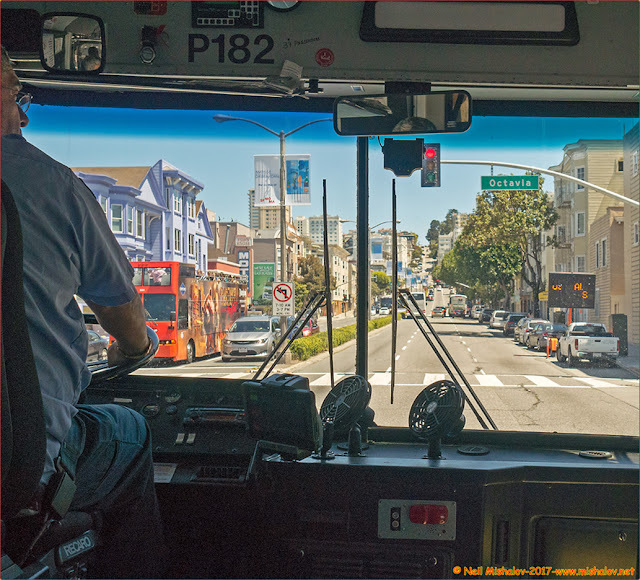 The final destination on its route is the Castro District. Click on the image to see the full-size photograph. 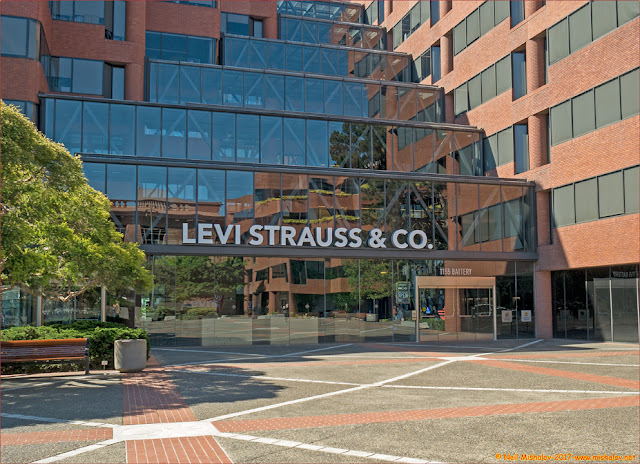 This is the corporate headquarters of Levi Strauss & Co. the manufacturer of Levi Jeans. The site is located on the east side of Telegraph Hill Click on the image to see the full-size photo. 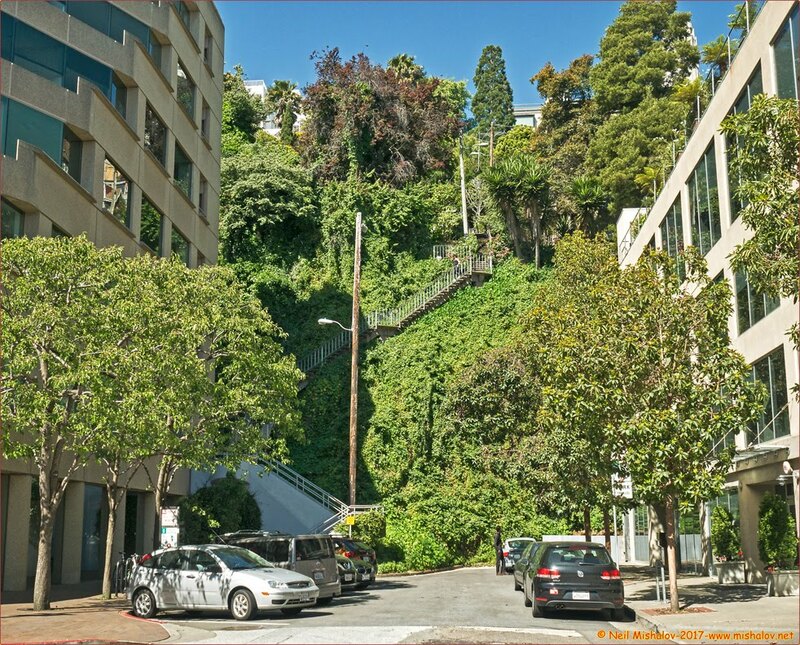 The east side of Telegraph Hill with the Filbert Steps leading the way to the top of the hill. Click on the image to see the full-size photograph. 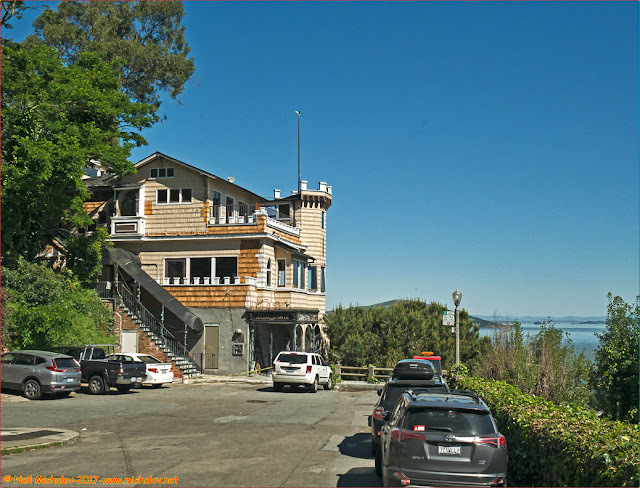 This is Julius' Castle, it is San Francisco Landmark #121 and is sited below the summit of Telegraph Hill. The view is looking north. Click on the image to see the full-size photograph. 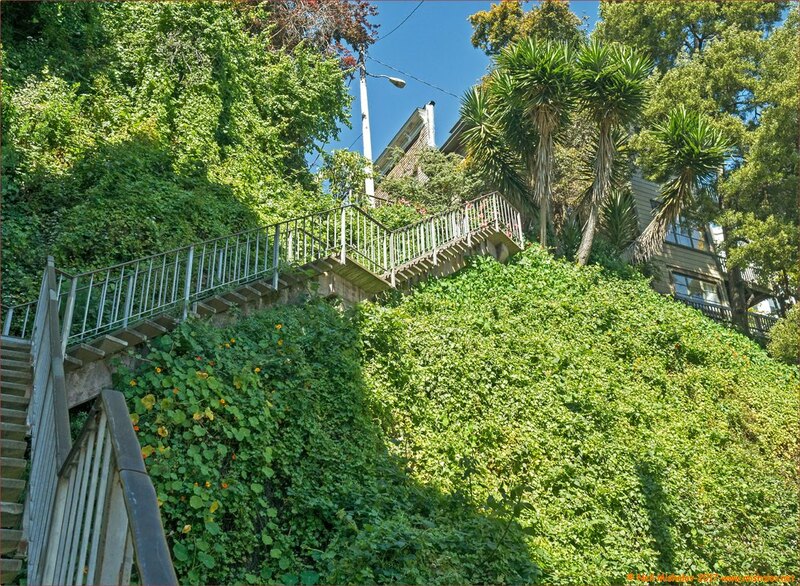 The Filbert Steps are steep and beautiful. Click on the image to see the full-size photo. This is a view of Nob Hill as seen from the summit of Telegraph Hill. The view is looking southwest. Click on the image to see the full-size photograph. 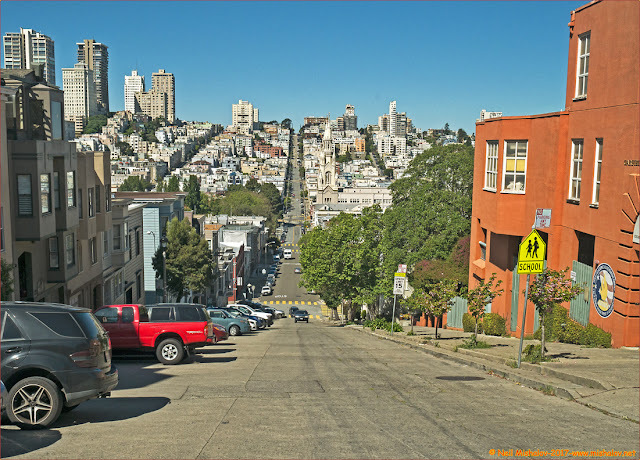 Here is a vista of Russian Hill as seen from Filbert Street on Telegraph Hill. The view is looking west. Click on the image to see the full-size photo. 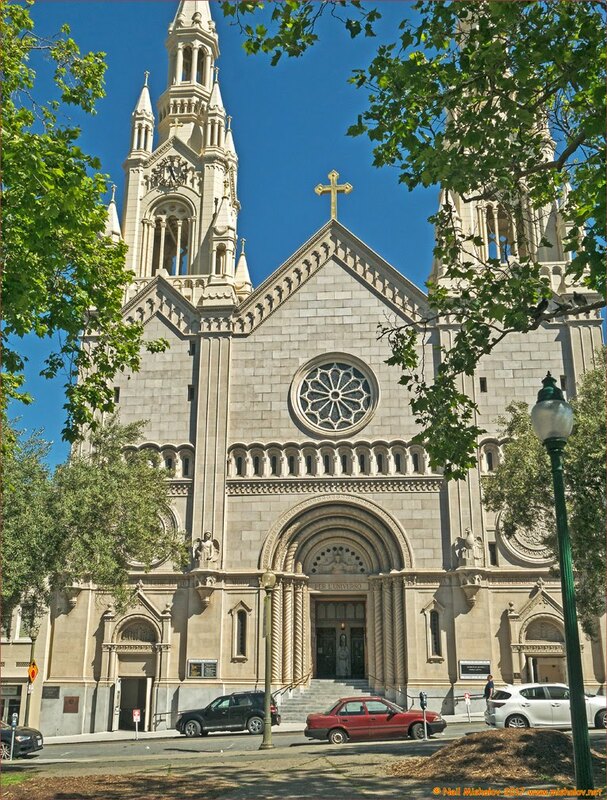 Saints Peter and Paul Church is located on Filbert Street adjacent to Washington Square Park. This is the church where baseball legend Joe DiMaggio's life story was recorded. DiMaggio married actress Dorothy Arnold at Saints Peter and Paul Church on 19 November 1939; 20,000 well-wishers jammed the streets during the wedding ceremony. They had a son on 23 October 1941 and were divorced in 1944. On 14 January 1954, DiMaggio and Marilyn Monroe eloped at San Francisco City Hall. After the marriage at City Hall, Marilyn Monroe and Joe DiMaggio went to Saints Peter and Paul Church to be photographed together on the steps of the church. DiMaggio was still married to Dorothy Arnold as far as the Church was concerned, and thus he could not be married to Marilyn Monroe within the church. DiMaggio's funeral was held at the church on 11 March 1999. Click on the image to see the full-size photo. Washington Square Park was established in 1847. 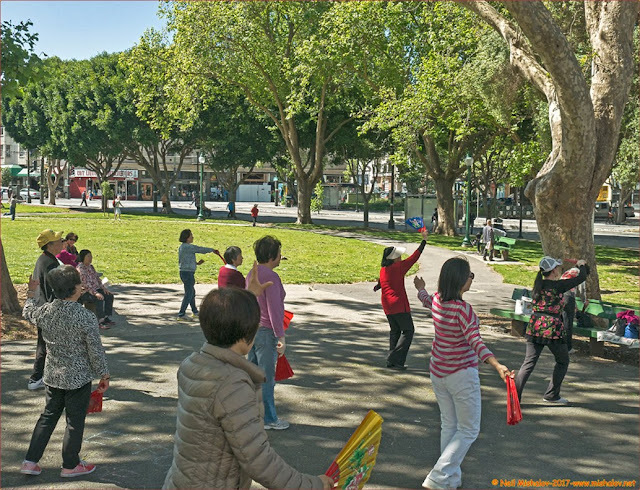 It is one of San Francisco's first parks. Here are a group of people doing their morning exercise in the park. Click on the image to see the full-size photograph. 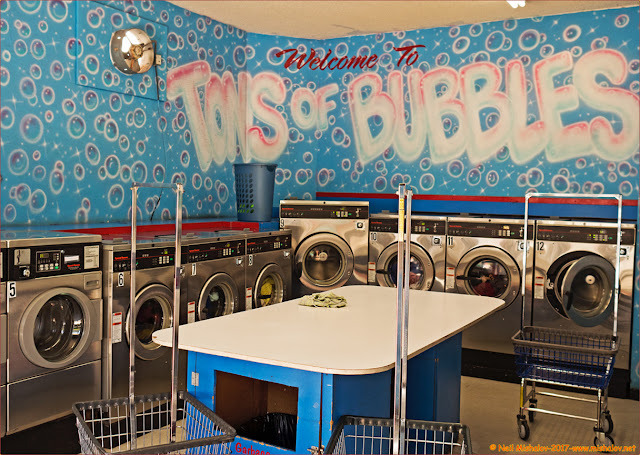 The Tons of Bubbles Laundromat is located on Russian Hill at the corner of Jones Street and Filbert Street. The business was started by Deanna Caprini on 21 November 2004, her twenty-second birthday. She is still making bubbles, and money, at this location. Click on the image to see the full-size photo. 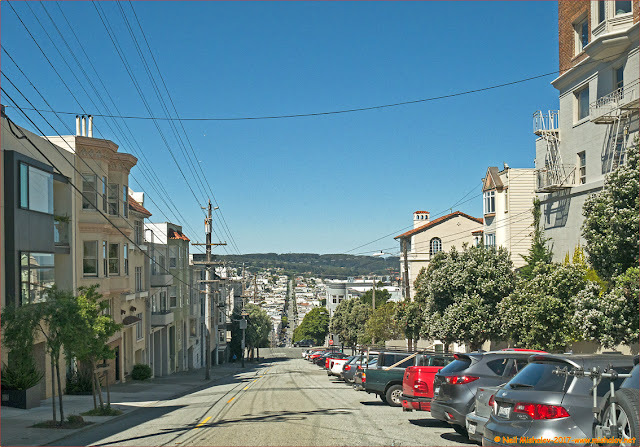 This is a view from near the summit of Russian Hill looking east down Filbert Street. Telegraph Hill is ahead with Coit Tower proudly occupying the top of the hill. Click on the image to see the full-size photo. Here is a view from Russian Hill looking west. The Marina District and the Presidio are visible. Click on the image to see the full-size photograph. The Palace of Fine Arts, located in the Marina District, was constructed for the 1915 Panama-Pacific Exposition; it was designed by the esteemed architect Bernard Maybeck (1862-1957). Bernard Maybeck moved to Berkeley, California in 1892, and was a professor at the University of California, Berkeley. Click on the image to see the full-size photograph. PresidiGo Shuttle is a free bus transportation system which became operational recently. 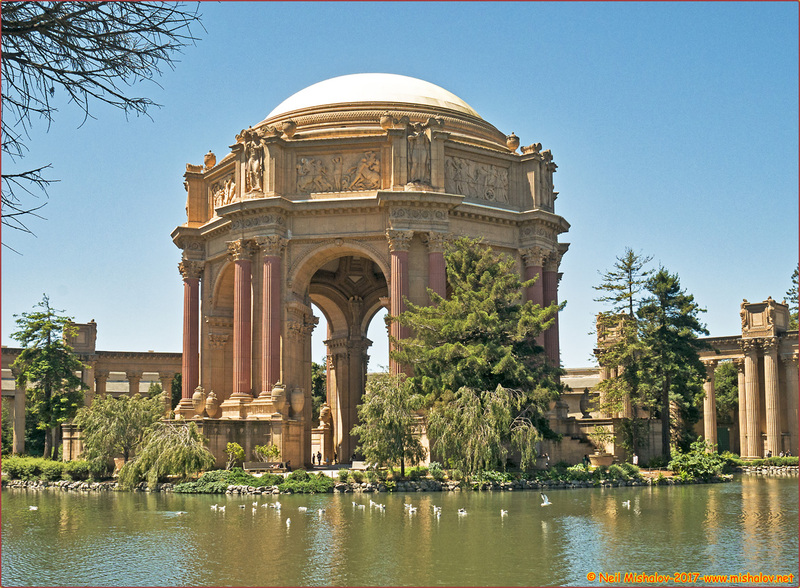 The shuttle was authorized by the Presidio Trust. 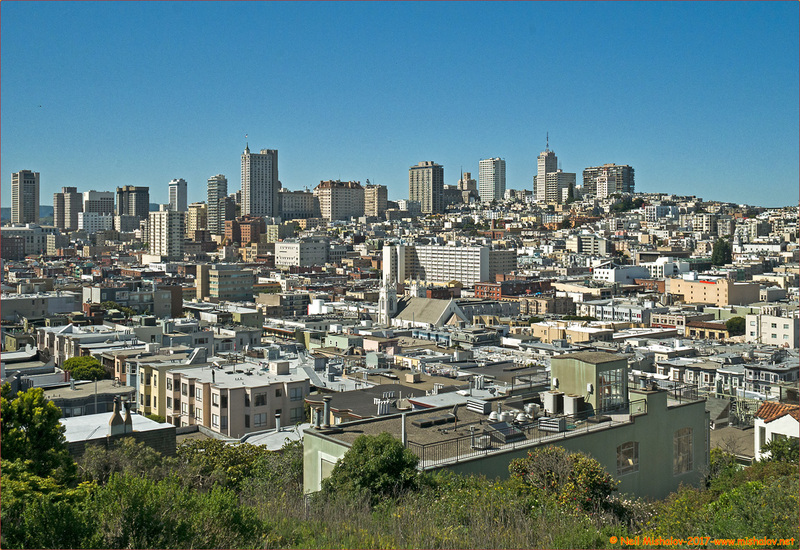 This picture was taken from a PresidiGo Shuttle bus as it heads from the Presidio of San Francisco to downtown San Francisco. The bus is now traveling east on Lombard Street. Russian Hill is ahead. Click on the image to see the full-size photo. This graph shows the elevation changes encountered during the walk. Click the image to see the full-size chart. 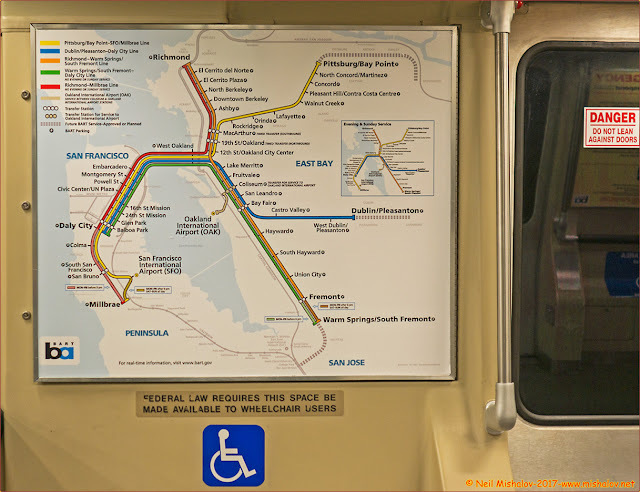 Bay Area Rapid Transit recently inaugurated a new train station on the BART system. The Warm Springs/South Fremont BART Station became operational on 25 March 2017. This new version of the BART route map illustrates the location of the new station. Click on the image to see the full-size photograph.